Jordan Harris, Scott A. Muller and Tim Woods summarise Chile’s achievements in establishing multi-level governance as a foundation for climate action. With ecosystems that range from the world’s driest desert to the ice fields of Patagonia, Chile is truly a climate laboratory: one that faces a multitude of threats across its 16 diverse regions. In the Central Valley, for example, unprecedented drought conditions have persisted for eight years, leading to water scarcity. Higher temperatures and heat waves across the country have led to an increase in forest fires, and the largest recorded fire in the country’s history occurred in January 2017, affecting eight regions. At the same time, average rainfall has increased in the southernmost Austral regions, as well as in the far north. Extreme rainfall events have triggered flash floods and landslides – in some of the driest areas of the world – wreaking havoc on local communities and ecosystems. Why is multi-level governance needed? In light of these varied threats, there is no one-size-fits-all solution for responding to climate change. Instead, it is essential to follow an approach that ensures local conditions and impacts are considered fully in regional and national-level planning processes. This requires coordination and collaboration between all levels of governance and all sectors of society. Multi-level governance – the interaction between institutions, levels of government, civil society and the private sector – determines how public policy and/or actions towards climate change action are defined, implemented and monitored. It is essential for bottom-up planning and decision-making that addresses local priorities and needs, as it helps to align local strategies and actions with national and international goals and commitments. That’s the case both for climate change adaptation and for mitigation – the focus of this article. Chile’s Intended Nationally Determined Contribution (submitted to the UNFCCC in 2015) opens with the bold statement that “Chile has positioned itself in the international arena as a country that seeks to support strong climate action”. As such, the plan is built on: resilience to climate change, including adaptation and capacity-building; control of greenhouse gas emissions (mitigation) and “cross-support for climate action”, including technology transfer and finance. The INDC pledges that the country will “reduce its CO2 emissions per GDP unit by 30% below 2007 levels by 2030”, and up to a 35%-45% total emissions reduction if international monetary support is received – excluding the land use, land use change and forestry sectors. Chile’s pathway to reducing greenhouse gas emissions – says the document – will aim to decrease poverty and inequality and “continue advancing toward sustainable, competitive, inclusive and low-carbon development”. Chile has historically had an extremely centralised governance system, and this remains the primary barrier to establishing multi-level climate governance. Subnational governments (regional, provincial and municipal) lack key faculties, capacities and resources. For example, they are often burdened with additional responsibilities under new laws, without the corresponding budgetary or technical support needed to comply. This creates problems with turning intentions into climate actions. According to Carolina Urmeneta, “to effectively integrate the various issues associated with climate change […] it is fundamental that, as a government, we are capable of taking the issue […] to a regional level, [for example] involving the regions from the start in the elaboration of the Climate Change Law, in order to incorporate a set of visions, concerns and realities from all of Chile’s regions”. Efforts are under way to address this. According to Carolina Schmidt, Minister for the Environment “[the Ministry of Environment is] working at a regional and local level to incorporate subnational perspectives into the framework Climate Change Law. This […] will consider the different realities experienced in our country and […] allow us to better face up to climate change”. In 2017-18, work began to establish Regional Climate Change Committees in each of Chile’s 16 regions, to act as regional focal points for action. This has been supported by a series of further activities to embed multi-level climate governance. Essential state and non-state actors were identified through a mapping exercise that led to an Institutional Mapping Report. This process, supported by LEDS GP through its ‘Subnational Integration Working Group, Early Mover Technical Assistance’ programme, used an innovative methodology that not only considered formal governance structures, but also informal actors. This was achieved by analysing decision-making spaces and characterising the interactions between state and non-state actors on different scales. Over the same period, and also with support from LEDS GP, technical training workshops were held to strengthen the capacity of national and subnational actors. These were led by the Ministry of Environment with the support from the NGO Adapt Chile. These included representatives from all of Chile’s regions, for example members of the Inter-Ministerial Technical Climate Change Team, the Regional Climate Change Committees and local municipalities. 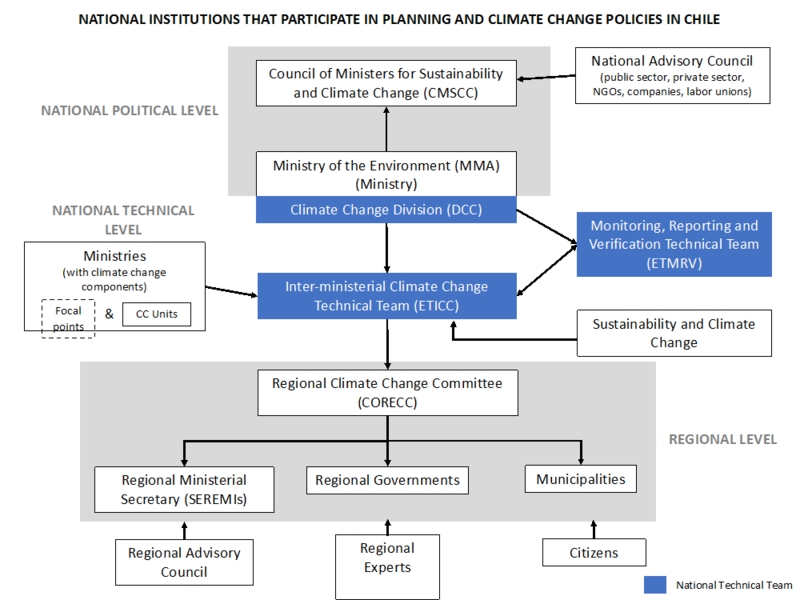 Responding to the results of the institutional mapping report, participants identified key factors and drivers for multi-level governance in Chile and provided inputs for the climate governance system. These will be included in the proposed Climate Change Law, set to be presented in 2019. Another initiative showing encouraging progress is the Chilean Network of Municipalities for Climate Action. LEDS GP supported workshops for Chilean mayors, both during the Rapa Nui Local Governments and Climate Change Summit and during the 2018 Mayors’ Forum on Climate Change in Santiago. These generated a Mayors’ Declaration regarding needs and commitments, which was presented to the Chilean authorities during the Mayors’ Forum. It will also provide direct inputs to the Climate Change Law, in terms of the mayors’ vision of the leadership role that municipalities must play in the climate governance structure. The information needed for effective climate governance is also increasingly available in Chile. Links between the Ministry of Environment and the academic sector have led to the creation of strategic climate information platforms that provide territories with climate projections and the opportunity to plan actions under different scenarios. Meanwhile, the National Inventory System, which tracks Chile’s greenhouse gas emissions, has been disaggregated to provide information on a regional scale. The Huella Chile programme has also grown and now includes measurements of local governments’ carbon footprints. By building up the capacities of the Regional Climate Change Committees, and with a regional focus in the forthcoming Climate Change Law, Chile now has the institutional infrastructure needed to fulfil its ambitious national goals, and even increase its ambition in international commitments. Further planned activities include developing a climate change financial strategy in line with Chile’s NDC, and strengthening climate governance within municipalities, for example by creating deeper links with the Regional Climate Change Committees. It will also be necessary to determine subnational contributions (to national goals) through local climate change mitigation actions. Capacity-building for subnational governments will continue, including for planning and finance, and for implementing national action plans at local scales. And Chile will continue to work with international partners – through South–South cooperation and public–private alliances – to push ahead with innovative approaches to climate governance and action. LEDS GP, together with the Chilean Ministry of Environment, Adapt Chile and the Multi-Level Government Climate Action Team in Chile, will continue to support the development of interactive spaces for collaboration between mayors, regional authorities and national technical planning institutions, and foster the growing public–private alliances that bringing civil society, academia and the private sector into local-level climate planning and actions. Chile has demonstrated the importance of building the necessary institutional ‘scaffolding’ to bring national policies and international commitments to bear at subnational scales. Limiting warming to 1.5°C will require all hands on deck; Chile will play its part by leading on multi-level governance for climate actions in Latin America. CDKN occasionally invites guest authors to share their insights through blogs on its website. These views do not necessarily represent those of CDKN or its alliance members.